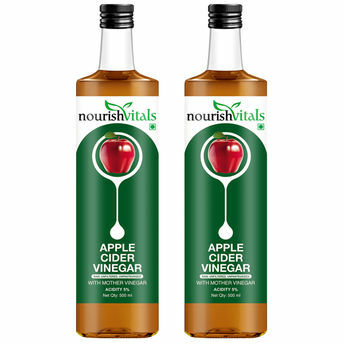 NourishVitals Apple Cider Vinegar is made from the juice of the finest quality of select apples grown in the orchard of the pristine hills of the Himalayas. It is 100% natural, raw unfiltered & non pasteurized retaining the natural residue and goodness as a mother of vinegars with its richness in natural components. It has no preservatives, no colors, no artificial flavors and is unfiltered with Mother Vinegar. For centuries, Vinegar has been used for various household and cooking purposes, as a flavoring agent and for various health benefits like weight management, helps supports a healthy immune system, improves digestion and many more. Apart from these uses, apple cider vinegar also has numerous other non-health related uses like hair conditioning, dental care, as a cleaning agent and it is especially useful for people who like to keep things natural and chemical-free. Pure, Natural with goodness of Mother of vinegar. Prepared from Apples grown in Himalayas.